LCD screen:3.0inch TFT LCD,16:9,270 degrees rotation With Screen. Power Supply: Rechargeable Li-ion battery. 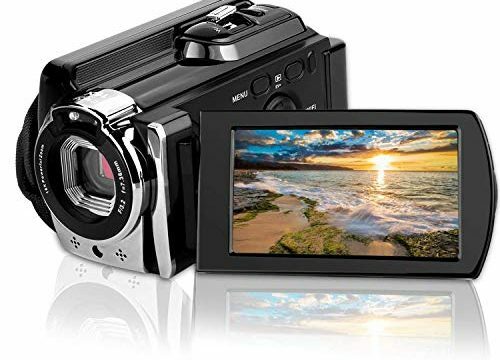 CamKing Camcorder: Supports 270 degree rotation with 3.0 inches TFT-LCD and fill-in infrared light.High quality 1280*1080P 30 FPS,3.0 TFT-LCD Screen,16X Zoom camera. Camcorder Features:HD camera camcorder,face capture, auto power-off, anti-shake, with internal microphone, speaker, LED light, USB2.0, and TV output. Easy to carry and store. WIFI Function:Support WIFI connection, Download “iSmart DV” APP in your mobile phone to connect your camcorder. So the mobile phone can control the camera and download files from camera. Infrared Night Vision Function: CamKing Night Vision Camcorder, a good helper for you to take some shots of footage at night.